Pictured L-R: Krystal Palomino, Chick-fil-A; Man of the Year Scott Vaughan, Burton Companies; Lifetime Achievement Award Robert McAllen, Robert McAllen Family Office; Woman of the Year Cynthia Cabaza, Shepard Walton King Insurance; Toni Marbar, Chick-fil-A and Board Member of the Year Bobby Calvillo, Affordable Homes of South Texas. 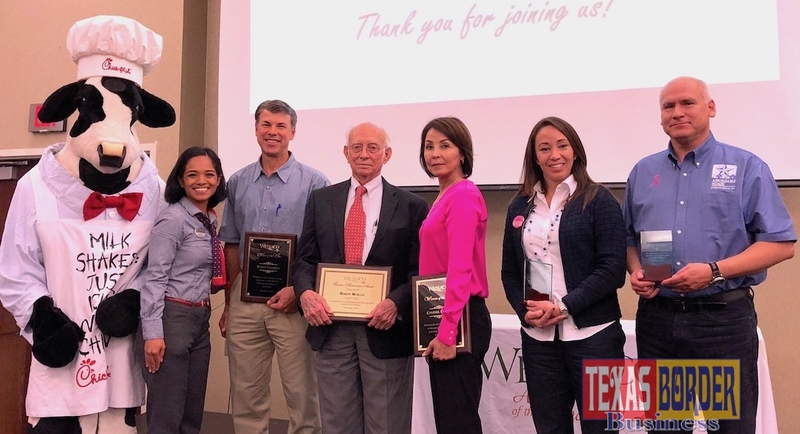 The Weslaco Chamber of Commerce held its annual membership luncheon on Friday, November 2 at the Knapp Medical Conference Center and awarded Man, Woman, and Business of the Year for 2018 as well as the Lifetime Achievement Award. The 2018-2019 Board of Directors was also introduced, as well as the board officers for this fiscal year. Cynthia Cabaza, Shephard Walton King Insurance Group was selected as the 2018 Woman of the Year. Cabaza is a life-long resident of Weslaco and serves many causes in the Valley. She has served on the Weslaco EDC Board for three years and currently serves as Board Secretary. She has been Board President of Fountain of Mercy ministries for nine years. Cabaza is well-regarded in the State of Texas where she has served professionally on the Board of Directors for the State Bar, the Commission for Discipline for the State Bar and a member of the Credit Union Commission of the Credit Union Department for the State of Texas. In addition, she is very active at St. Pius X Catholic Church where she serves as Eucharist Minister. Robert McAllen received the 2018 Lifetime Achievement Award. McAllen has been heavily involved in the Weslaco community for close to 60 years. He has served on several boards of directors, including Weslaco ISD, Knapp Medical Center, Weslaco Chamber of Commerce and the RGV Boy Scout Council. In addition, McAllen served as president of the RGV Partnership and the Weslaco Rotary Club, where he has had perfect attendance for over 50 years. Business of the Year went to Chick-fil-A of Weslaco. Chick-fil-A opened its doors in Weslaco in July 2014 and has been a strong community support from the very beginning. The restaurant supports local schools with mass food distributions including randomly surprising high school band students with chicken sandwiches after practice one day. In addition, Chick-fil-A has sponsored several Chamber networking events and committee meetings. Most recently, the company has signed on to be the title sponsor for Weslaco’s 100 Celebration next year. Additional honorees included Volunteer of the Year Jennifer Rektorik; Chamber Board Member of the Year Bobby Calvillo, Affordable Homes of South Texas and Retiring Board Member Esperanza Garza, Margo’s Corner. The Weslaco Chamber would like to thank its investors: Knapp Medical Center, Texas Regional Bank, Magic Valley Electric Co-Op, Davis Equity Realty, Payne Auto Group, Texas National Bank, Rio Bank, Weslaco Regional Rehabilitation Hospital, Greater State Bank, Montalvo Insurance and Holiday Inn Express Hotel & Suites. Thank you also to table sponsors City of Weslaco, Frost Bank, Rios of Mercedes, Shephard Walton King Insurance Group, Charlie Vaughan, Weslaco EDC, and Weslaco ISD.